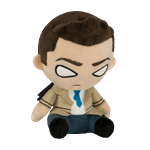 When they're not out hunting demons, ghosts, monsters, and other supernatural beings, Sam, Dean and Castiel are moping around as part of Funko's new line of Supernatural Mopeez Plush Toys! This Mopeez features Castiel, a powerful angel of the Lord who was responsible for saving Dean Winchester from Hell, on the archangels' command. Cheer him up by giving him a new home in your Funko collection!